NEW to supersmile® and five years in development by Dr. Irwin Smigel, world-renowned, Father of Aesthetic Dentistry. Supersmile®'s revolutionary Extra White System has the highest concentration (3x the level) of Calprox®, the unprecedented science behind supersmile®. Calprox® is a proprietary formula of encapsulated calcium peroxide and minerals which gently and effectively remove the sticky bio-film from teeth, to which plaque, bacteria and stains (such as coffee, tea, tobacco and red wine) adhere, without the risk of sensitivity. Extra White is clinically shown to deliver an average of 2 shades whiter teeth after just ONE brushing and an average of up to an unparalleled 9 shades in 30 days. Delivers maximum removal of deep set teeth stains, without sensitivity. Shown to support gum health. Just brush and whiten - no need to change your daily habits. Restores bonded teeth, veneers, caps, dentures to their original shade. Comes in modern, sleek airless pump for a premium use experience and features a new, fresh and delicious Triple Mint flavor. Contains calcium, magnesium, phosphates and fluoride which remineralize and restore enamel. Free of silica, parabens, sulfates, known allergens, animal byproducts and BPA. It's also Kosher. 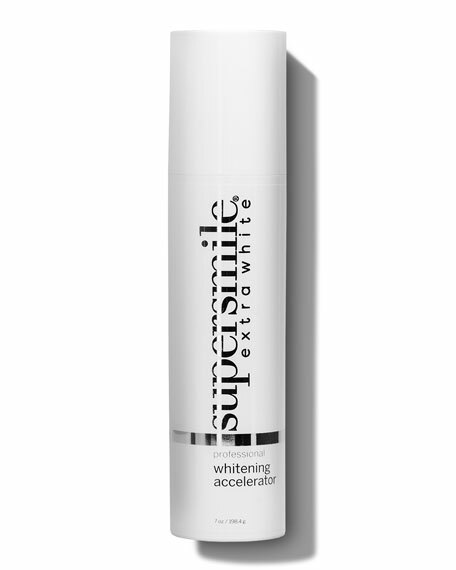 Supersmile is an innovative line of at-home teeth whitening products designed to safely and effectively clean teeth while contributing to better oral health. Supersmile was created in 1992 by Dr. Irwin Smigel, a highly respected figure and pioneer in cosmetic dentistry (he is often referred to as the father of aesthetic dentistry). Keep your brows and lashes well dressed with these gorgeous hot pink, glittering and metallic must-haves with bonus lash comb.